Amazing Munzee Announcements: Munzee partners with Fitbit! Munzee is about exploring your surroundings, getting outdoors, and enjoying your environment. With all that exploration, comes the added benefit of walking, wellness, and an active lifestyle. At the core of our game, we’re passionate about wellness. Improving yourself as a player, and a healthy active individual is what makes each day great for Team Munzee. Fitbit, a leading fitness tracker company, is dedicated to helping people lead healthier, more active lives. What better way to lead an active, healthy lifestyle than by combining wellness with the fun of Munzee? Today, we’re happy to announce we were approved (yesterday) by FitBit as a partner! This news is so exciting we just had to share it with everyone. Team Munzee will begin by offering Fitbit products through this link. Players can expect to see official Fitbit information on our blog, badges, competitions, and fun Fitbit options incorporated into Munzee. This is another opportunity for players to enjoy “a game within the game”. Special Note: When you first select the Fitbit menu option, you will be able to configure it for multiple users… Great News for couples that play together or family teams! We’re excited to offer a trusted, reputable fitness feature within our app, and encourage everyone to welcome Fitbit into their active Munzee lifestyles! Get your Fitbit now, so you will be ready when the app launches. You may not always “see” this player out and about, or as an active face on Team Munzee, but she’s the amazingly creative mind behind every pin we hunt after, every badge we seek out, and all the stunning graphics we see on the website and Social Media. This week’s Player of the Week goes to our very own Team Munzee Designer, Trish Vandehey (Vanderarban)! Let’s take a moment to get to know the incredibly creative player that’s brought us Mustaches, must-earn badges, and impossible Munzee-capable smartphone printers! I had gone out with my other half, Hayden, to do some walking and caching. While searching out the first one at the entrance to the park I spotted a Munzee. I had seen a few articles about it in the previous year and had mentioned it to Hayden, so I was pretty excited to spot one and be reminded about the game. Unfortunately, my signal was really bad and I was unable to capture the Munzee. But the second I got home I made an account and starting playing. I plan on going back soon to scan that first Munzee. How did Munzee “Find” you (how did you become a member of Team Munzee)? I was in contact with Rob from almost the start. Hayden and I had met up with him a few times to play and offered our talents excitedly to grow the game. Later on Rob contacted us to help out with a project and that was followed by BADGES! It’s been a great ride ever since! Trish and Rob introduce us to Rover! Hmm, that is a tough question. I really love everything about Munzee! Initially Munzee was a great excuse to get out and get moving. I have a tendency to “forget” about cardio when I get wrapped up in everything going on. Munzee gives me motivation to get out and get stepping! The player community is really amazing. I started using the forums and later Munzee Madness Facebook group as a new player to learn more about optimizing my Munzee experience. Everyone was really awesome and helpful. There was a real sense of community. I have made some really great friends both far and near (a few I have yet to meet)! Trish is the center of attention (or at least this group shot) of cool players met at MM III! I think one of the biggest assets Munzee has that I noticed from the start was the Team. I was really impressed as a new player how involved Team Munzee was in the player community. Whether chatting online or at an event they are really active within the player community. I am really lucky to have the opportunity to work with such a great group of people! What is on your wish list for Munzee? I’m really excited about how much Munzee has grown since I started playing, I am looking forward to seeing it get even bigger and be in the middle of it. 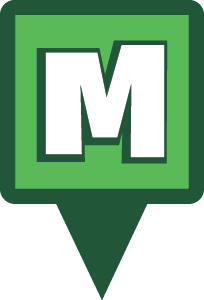 I had a lot of fun at MM3 and look forward to seeing a future mega Munzee event that I would be able to attend and meet some of the amazing players that I haven’t had the opportunity to meet in person. Vanderarban and Rynee having a silly time at Munzee Madness III! Specials, I really like those, who doesn’t 😉 And maybe some really cool ridiculously hard to figure out badges. When you’re not drawing up the latest icons, Facebook covers, or coming up with amazing event ideas, how are you spending your free time? Free time? What’s that? Just kidding. Actually, as it may be becoming apparent, I really enjoy the outdoors. When it is warm I like to hike and spend time at the lake. I’m a crafter of just about anything I can dream up, from costumes to soap. I also enjoy reading, singing bad karaoke and travelling when I can (insert “Hangover” movie reference here). Trish was awesome enough to share her special Social with us, here it is below! Thanks Trish for all you contribute to Munzee, and we hope to see you at more events! Maybe we’ll hear you on the podcast soon? Player of the Week Mark Holmes and a special Team Munzee announcement! April is Autism Awareness month, a month that hits home to many in the Munzee community. This week, we’d like to honor a pillar of the Munzee community, share his family’s story, and reach out to the community in a big way. This week’s Player of the Week is Mark Holmes (player Rosemark). Mark’s family has an incredible story to share with us, and we’d like to show our support this month. Check out this Player of the Week interview, and then get involved with Munzee’s plans for April! We are the Holmes family. Mark and Roseanna Holmes, Kevin and Katlynn Holmes, Tony, and Melissa. The family Munzee name is (Rosemark). I, Mark Holmes, Munzees under the name Rosemark. Roseanna has her own account (Tupperose). Kevin and Katlynn Munzee under (Computerwiz41). 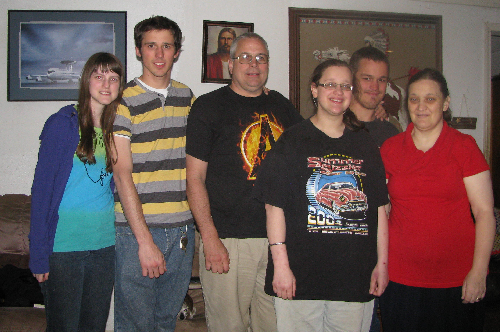 Tony and Melissa are special needs adults and Munzee with the family. How long have you played Munzee? Just under a year. My family is an avid team of cachers for the same reasons that we are into Munzee. At a caching event, we were introduced to Munzee by another player, Team2MM. I found it intriguing and saw it as a perfect park and grab game, but it was weeks later before I actually tried it. I was hooked on my first night out because my two special needs children thoroughly enjoyed it. The family atmosphere. Having special needs children/adults (they are grown but will live at home forever), it is a wonderful activity for the family that they can fully participate in and it is therapeutic to their social and physical needs. I would like to see more special badges and special icons that the family can pursue and achieve! I am a retired Police Officer of 23 years on the force, and now work for a well-known convenience store. My wife, Roseanna, is a stay at home mother. My son Kevin and his wife Katlynn live nearby. Tony and Melissa are special needs adults. They have Fragile X Syndrome, a genetic disorder that causes physical and mental disabilities. As a result of the Fragile X, Tony has also been diagnosed with Autism and Extreme ADHD. Melissa is legally blind without her glasses, but can see sufficiently to get by with glasses. Both are developmentally delayed to the mental capacity of approximately nine years of age. This is why Munzee is such a great advantage to our family as both Tony and Melissa thoroughly enjoy the hunt and it helps them physically and mentally in their development. Thank you for your support during this Autism Awareness Month! Mark and his family have shared their awesome Social Munzees with us. Check them out below and then scroll down for a special announcement from the Team! 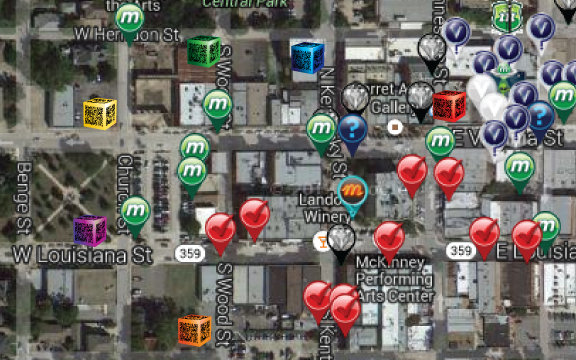 To celebrate and bring awareness to April’s Autism theme, Team Munzee has deployed 680 special icons on the map. 680 represents the 1:68 ratio of children born with autism currently. These special icons will be placed on the map only on regular greenies that aren’t in maintenance mode. When a heart has been captured the icon will bounce somewhere else in the world, only one capture per heart at a location. Any player may capture the icon, even on a Munzee you have captured previously. The only exception is if a heart lands on a Munzee you own, you are never able to capture a Munzee you own. You will earn a special capture heart icon for each heart you cap. If the heart isn’t captured within 6 hours it will move on to a new location around the world. The points for capture will be exactly like a diamond, the owner and capper will split a sum of 20 points. For example, 7 for cap gives 13 for owner, 9 for cap gives 11 for owner. Hearts will remain on the map until the end of April, so stay patient and keep one eye on the map. We encourage you to show your support and cap as many as you can! In order to show our support for this cause, Munzee will donate 50 cents for each heart captured to an autism charity selected with the help of the Holmes family. $5000 donation made to Doug Flutie Jr. Foundation for Autism after researching organizations making the best use of incoming funds. Thanks to all Munzee players for capturing hearts and raising Awareness for Autism during the month of April. Keep making a difference while you grow the map! Sparkly nails and a shiny, positive attitude! From the very beginning, this new Munzee player has been eager to lend the community (and Team Munzee) a helping hand. This week’s Player of the Week is Tarah Hamilton, player name Tarirae! Technically I signed up over a year and a half ago but never played. I actually started playing about 6 months ago. I was on the phone with a friend telling him that I needed a way to get my kids outside and keep ME busy at the same time. He suggested Munzee and explained what it was. 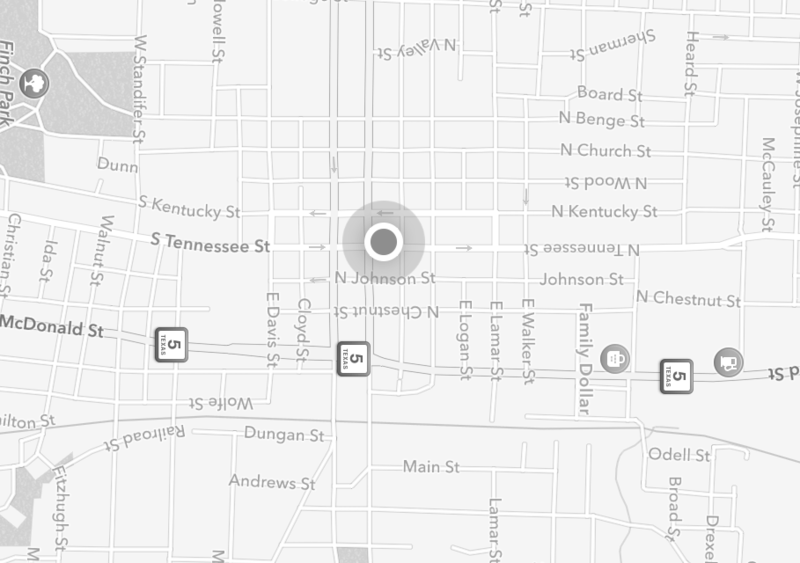 After downloading the app, I noticed there was not much in the area and scraped the idea. It wasn’t until a year later that I was deleting apps on my phone and looked at it again. I saw there were about 10 close to me and searched for them. I was hooked after that! The amazing places I find. Sometimes it’s a restaurant I’ve never been to or a park I didn’t know existed. Recently I made my first trip to downtown Pittsburgh, Pa just to get a MVM garden. It was only 14 degrees that day, and kids were in school, but it was a wonderful day trip. Even though at one point I couldn’t feel my fingers through my gloves anymore, and was yelling “45 points!” through chattering teeth, I still had a smile plastered on my face. I would love to get 10k in one day. I know around here that would be impossible… for now, so I hope to make a trip down to the Franklin, TN and go for the gardens there. My other is maybe a recruiter badge (hint hint) Since I started, I have talked about Munzee so much that I have gotten at least 8 people to try it and a few of them hooked. I am currently a stay at home mother of two young boys (6 & 8) and an indie author of the book “Copperback”. I have recently done some freelance writing for Munzee including the new webpage (if you find a misspelling, I blame my editor!) My oldest son has ADHD and struggles with stepping away from his comfort zone of electronics and games. Munzee has been a big help in showing him that he can use technology while keeping him physically active while we hike around town. My youngest son now gets excited anytime he sees a QR code on anything and begs me to scan it for points. Usually we try to go out on the weekends and find a place on the map we have never been before. Outdoor photography with my Canon Rebel, crocheting anything I can, and writing my second book as well as short stories. I also have started doing nail art and helping make nail polish with a friend of mine. I keep an Instagram (@tarirae) of new polishes and nail art tutorials.